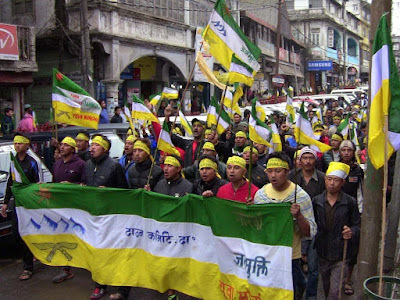 Fear has gripped the Darjeeling Hills following an announcement by the Gorkha Janmukti Yuva Morcha (GJYM) of organising a rally in Darjeeling tomorrow defying Section 144. The GJYM has threatened that if the police try to stop them, they would give a call for an indefinite total bandh. GJYM adviser Jiten Rai has said the rally was to protest “police atrocities” and has demanded immediate release of those arrested since June 8 when Gorkha Janmukti Morcha (GJM) supporters clashed with the police in Darjeeling. GJM’s call for indefinite bandh in Gorkhaland Territorial Administration (GTA) and state and central government offices in Darjeeling Hills to press for the demand of a separate Gorkhaland entered its third day today. On Tuesday, GJM chief Bimal Gurung got a shot in the arm after five parties and an apolitical Gorkha outfit took part in the all-party meeting he called in Darjeeling and unanimously vowed to fight for a separate state of Gorkhaland. Even though a local leader of BJP was present at the all-party meeting held in Darjeeling yesterday, BJP state president Dilip Ghosh today denied that BJP was in favour of creation of a separate Gorkhaland state carved out of West Bengal. Talking to reporters at Tamluk, Ghosh alleged that the ruling Trinamool Congress and GJM headed by Gurung were fighting in Darjeeling to create division between Bengalis and Nepali-speaking people so that TMC and GJM both could derive political benefit from the polarisation. In a related development, West Bengal government appointed a new secretary of the GJM-run GTA. C Murugan, who was the managing director of Tourism Development Corporation, has replaced Donbosco Lepcha and will take over charge as GTA secretary immediately, a notification said. CM Mamata Banerjee, it may be noted, has ordered special audit of the GTA expenses suspecting financial bungling by the GJM-ruled autonomous body. She today also met Governor Keshari Nath Tripathi in Raj Bhawan to brief him about the situation in the hills.